In the bar-parlour of the Angler’s Rest, Mr Mulliner tells his amazing tales, which hold the assembled company of Pints of Stout and Whiskies and Splash in the palm of his expressive hand. Here you can discover what happened to The Man Who Gave Up Smoking, share a frisson when the butler delivers Something Squishy on a silver salver (‘your serpent, Sir,’ said the voice of Simmons) – and experience the dreadful Unpleasantness at Bludleigh Court. Throughout, the Mulliner clan remains resourcefully in command in the most outlandish situations. ©1929 The Trustees of the Wodehouse Estate (P)2014 Audible, Inc.
Wodehouse at his very best! Very very funny, and incredibly well read, as usual for this reader. HIGHLY recommended! This volume contains three of the funniest stories Wodehouse ever typed: “Unpleasantness at Bludleigh Court”—including a perfect specimen of comic verse—the ultimate Bobbie Wickham story, “Something Squishy” and the two last stories which really constitute a single saga of the sufferings and ultimate triumph of Dudley Finch. And the other five are pretty near prefect, too. 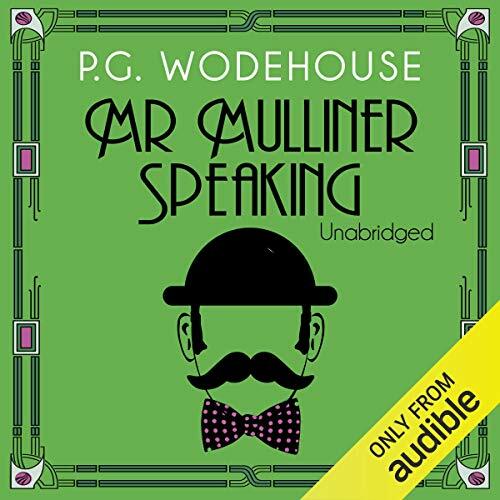 This book has a place of honor in my perpetual Wodehouse playlist, doing its part to keep a smile on my face and a spring in my step. It's a course of treatment I recommend to all my friends. There is scarcely need to review the content of this book - it is, as it says on the cover, by PG Wodehouse and is, therefore, a work of considerable genius. It is a collection of nine short stories originally published in 1929. Each story relates a tale of one of the narrators extended family and is told in the bar of Mulliners' local pub. Despite the efforts of his fellow drinkers to prevent him doing so, Mulliner always manages to tell his tale. Jonathan Cecil, the narrator, does a wonderful job in capturing the voices and brightness of the delivery that is essential for Wodehouse.